Please return to our Home Page for ordering information and instructions. THE CITIZENS WHOLESALE SUPPLY CO. This mill was in fairly rough shape when I got it with almost 100years of dust and grease covering it so it was disassembled and all the internal metal parts were wire brushed down to bare metal and the external wooden parts were lightly sanded and refinished with an antique oil finish. It had a hole that someone had drilled in the back to hang it off a hook that I repaired. The metal plaque on the front retains it's original finish and it's original glass window that allows you to see how much coffee remains in the grinder. This mill is now in very good condition and ready to put back to work if you wish. It comes with an original Arcade No. 3 catch cup which was the one that was originally used with these mills. It has measure marks 2, 4, 6 and 8 on the front with hash marks in between for the odd numbers. The bottom is embossed with Arcade Mfg. Co. Freeport Ill. with a number 3 in the middle. The catch cup has a tiny flea bite on the upper lip and an inclusion (looks like a scratch but is from when it was made) in the glass that starts right below the embossed "r" in "Freeport Ill." and loops under it in the base. The square lid on top is original and is more rare than the round lid that is usually found on these. This is the last of the crystal series of coffee mills manufactured by Arcade. The 9010 was manufactured in the 1920's and has a very sleek, art deco look with vertical lines running throughout the mill. It has the majority of it's original finish but there are some small areas where surface rust had started to develop. These were oiled and cleaned to stop them from advancing. I installed a new gasket between the hopper and body as the old one was dried out and hardened. It is in overall very good condition with only the following flaws to report. There is some minor chipping around the top lip of the hopper that is most likely from when the glass was ground at the factory and there are two areas (front and back) of missing glass on the lower lip of the hopper where it is clamped into place by the body halves. These were most likely caused when the original gasket gave out and the hopper was allowed to move back and forth. They do not affect usability and are not even visible unless you look down into the hopper or disassemble the grinder. The lid is in good shape with no dents but does have original paint loss and some paint spots from when Grandpa painted the kitchen. The original catch cup is almost flawless and looks like it just left the factory. This mill has been thoroughly cleaned so it's ready to hang and use. This 9010 mill measures approx. 16" tall with the catch cup and a little less than 4" wide not including the adjustment knob. This Arcade Crystal No 3. had almost no original finish left when I got it so it was sandblasted and repainted in a semi-gloss black which is very close to an original finish. It has a glass hopper with no chips or cracks which is embossed with "Crystal No. 3". It has the original "Arcade" embossed lid which has a few very light dents but screws on and off easily and is also embossed "Arcade Crystal" on the cast iron body. The gasket between the glass hopper and the cast iron body was replaced as it had dried out and was not holding the hopper as it should. The top lip of the hopper has a small bubble that burst through when it was being blown, it has been smoothed over so there are no sharp edges. It has a replacement horseshoe and star catch cup that is very close in size and style to the original cup. This mill has been thoroughly cleaned with anything not painted being wire brushed down to bare metal. It measures about 19" from the top to the bottom of the pull ring. Arcade Crystal No. 3 Coffee Grinder or Mill This Arcade Crystal No 3. had almost no original finish left when I got it so it was sandblasted and repainted in a semi-gloss black which is very close to an original finish. It has a glass hopper with no chips or cracks which is embossed with "Crystal No. 3". It has the original "Arcade" embossed lid which has a few very light dents but screws on and off easily and is also embossed "Arcade Crystal" on the cast iron body. The gasket between the glass hopper and the cast iron body was replaced as it had dried out and was not holding the hopper as it should. It has a replacement horseshoe and star catch cup that is very close in size and style to the original cup. This mill has been thoroughly cleaned with anything not painted being wire brushed down to bare metal. It measures about 19" from the top to the bottom of the pull ring. The original finish on this mill was almost completely gone so the mill was sandblasted down to bare metal with 100% of the original finish being removed, the cast iron was wire brushed to a high sheen and given a few coats of a clear enamel to give it an industrial look, (Arcade did make some No. 3's with a nickel finish and this looks very similar to those). It has it's original embossed "Arcade" lid that does have some small dents but screws on and off easily. The hoper is embossed "Arcade Crystal No. 3 and has some fine scratches and use marks as should be expected of a tool of this age. It is embossed "Arcade" and "Crystal" on the main body of the mill above the handle. I installed some new gasket material between the body and the hopper because the old one had dried out and was not holding the hopper in place as it should. It has an old horseshoe and star cup that fits well in place of the original catch cup. This entire mill has been thoroughly cleaned with the interior parts wire brushed to bare metal and the exterior carefully cleaned and/or refinished. It measures about 19" from the top to the bottom of the pull ring. Manufactured by the Arcade Mfg. Co. of Freeport, Ill. this Crystal No. 3 coffee mill still has the majority of it's original finish left but had been painted over several times when Grandpa did the kitchen walls so it was cleaned to bare metal and repainted in a semi-gloss white. It has an embossed "Crystal No. 3" hopper with the original embossed "Arcade" lid. It is also embossed and highlighted in gold with "Arcade" and "Crystal" on the main body of the mill. I added a little extra gasket material between the body and the hopper because the old one had shrunken slightly with age and was not holding the hopper in place as it should. It has an old horseshoe and star catch cup replacing the original. There is some slight roughness where the base of the lid meets the hopper but this is from when it was manufactured and is not a defect. This mill has been thoroughly cleaned with the interior parts being wire brushed to bare metal and the exterior carefully cleaned and refinished. It measures about 19" from the top to the bottom of the pull ring. This mill is actually a two for one deal. You are getting a functional coffee mill along with a piece of art. I'm not quite sure what to call the artistic style on this mill but it's somewhere between Pennsylvania Dutch and tramp art. The mill was manufactured by the Arcade Mfg. Co. of Freeport, Ill. It has it's original glass hopper embossed with "Crystal No. 4 in cursive script and panels which follow through to the cast iron body that is embossed with "Arcade". The lid is original and is embossed "Arcade" in cursive script. This mill has some wear to the paint that was added to the glass hopper and a few spots of paint that were slopped on when grandpa painted the kitchen but the black underneath is the original finish and is in good condition with minimal paint loss. All internal and external parts have been wire brushed or cleaned as needed. I lightly cleaned the outside of the hopper so there was no additional paint loss. This mill is equipped with an old jelly jar as a replacement catch cup so it's ready to hang and use. Manufactured by the Arcade Mfg. Co. of Freeport, Ill. this No. 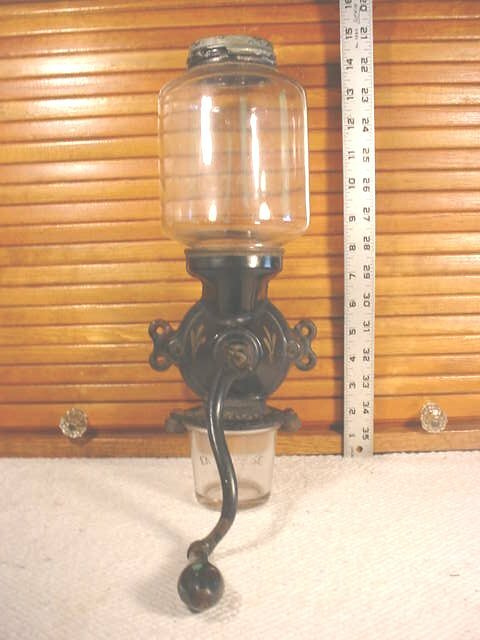 40 Arcade coffee mill has a clear glass hopper embossed with "Crystal No. 4" in cursive script and panels which follow through to the cast iron body that is embossed with "Arcade". The lid is original and is embossed "Arcade" in cursive script. The original gasket between the hopper and the cast iron body was still in good shape and only needed a slight amount of extra material added to hold the hopper tightly in place. The screw and nut that hold the catch assembly to the body are replacements but these are not normally used as the hole becomes a third mounting point. This mill had some light surface rust on the exterior of the body but a coat of Liquid Gold and a light brushing cleaned it up well enough that I decided to leave it as is. All internal and external parts were wire brushed or cleaned as needed so it's ready to hang and use. The Crystal No. 1 was the first glass hopper mill produced by Arcade. This mill has it's original un-embossed lid and hopper and a replacement catch cup. Although this mill is identified as a No. 1 mill on the embossing above the catch cup, I refer to these as an "improved" or a "1.5" No. 1 Arcade coffee mill. I can only assume that Arcade discovered that the original No. 1 design which used rubber grommets to hold the catch cup needed improvement so they removed the grommets and added a spring loaded catch assembly. This is the first of two versions of the rare Fruit Jar mill made by Arcade. Both models will take either a pint, quart or two quart canning jar with a threaded lip. These are hard to find complete with all the original parts as this one is. The original finish was almost non existent except for a small area that remained on the back so it was sandblasted and repainted in a semi-gloss black that is very close to the original finish. It measures right around 15" tall with a quart sized fruit jar. This mill was manufactured by the Arcade Mfg. Co. of Freeport, Ill. around 1900. This X-Ray mill was covered with green paint, the back board had splits through the mounting holes and was badly chipped on the sides so the back board was replaced, the rest of the wood was stripped then lightly sanded and finished with a golden oak stain and an antique oil finish. The glass viewing window was broken so it was replaced with an older pane of glass which now has a reproduced Arcade X-Ray label attached. This mill has it's original japanned finish on the exterior of the cast iron and the mill was completely disassembled and cleaned to like new condition with all the interior parts wire brushed to bare metal. A washer was placed between the handle and the body of the grinder to increase the clearance between the handle and the hopper holding the coffee. (Many of the x-ray mills have the two notches or rub marks where the handle would hit the front of the box when rotated). The wing nut is not an original Arcade but is from another make of coffee grinder from the same era and works well. This mill comes equipped with a reproduction catch cup which is almost identical to an original. The length of the wood portion is right around 11 1/2" (14 3/4" long with the catch cup hanging at the bottom), 4 3/4" wide and 3 1/2" deep. Arcade made the #25 mills in several slightly different versions. Although they all had the same cast iron body style, some are embossed on the neck below the hopper with "Arcade", but others have no embossed name at all and yet others are found with the names "Atwood", or "Lees" embossed. Some were produced with "Arcade 25" embossed hoppers and others have plain hoppers. No one seems to know exactly why this was, but I suspect that Arcade may have manufactured some of these mills for distribution by other companies. This is an early style Arcade Crystal No. 3 Catch Cup that was supplied with the No. 3 coffee grinders when they were new. Not very many of these have survived through the years as they were often broken and rather than pay the 15¢ that Arcade wanted for a real replacement glass they would just substitute any glass they had which would fit. It has measure marks 2, 4, 6 and 8 on the front with hash marks in between for the odd numbers. The bottom is embossed with Arcade Mfg. Co. Freeport Ill. with a number 3 in the middle. There are no chips or cracks on this glass, but here is a small inclusion that looks like a scratch starting above the "3" in the base and running to the outside edge. This and the bubbles present in the glass are common with these cups and is from when it was produced. The glass is clear, but the glass on these earlier cups tends to have a slightly darker tint to it. This cup as well as all original Arcade cups measures approximately 3 3/4 inches tall. This is the later style of original catch cup that Arcade used on the Crystal No. 3 mills. It has measure marks 2 - 14 on the front with hash marks in between for the odd numbers and Tablespoons written across the top. The bottom is embossed with Arcade Mfg. Co. Freeport Ill. with a number 3 in the middle. There are no chips or cracks on this glass, just some minor scratches and the usual swirl marks and some straw marks from the manufacturing process. There are some heavier straw marks in the base of the cup. None of these are cracks and most likely formed during the cooling process. This is an original Arcade Crystal No. 4 or No. 40 coffee grinder catch cup. Even fewer of these are found as the production runs of the No. 's 4 and 40 were much smaller than the No. 3's. It has measure marks 2 - 14 on the front with hash marks in between for the odd numbers and Tablespoons written across the top. The bottom is embossed with "Arcade Mfg. Co" with a number "4" in the middle and "Freeport, Ill" below that. This cup has a few of t he usual straw marks and bubbles in the glass from the manufacturing process and there is a small chip on the back of one of the ridges and another tiny spot on the front that I believe is from when it was made. This cup as well as all original Arcade cups measures approximately 3 3/4 inches tall. I refer to the two cups shown as Arcade "Generic" cups as they was used on many grinders manufactured by Arcade. This is the earlier version of the cup with the writing on the base more towards the center and the base itself is slightly more concave than the later "Generic" cup. In addition to the Arcade 25's this cup also came with the Golden Rule, Bell, and Monarch mills. This cup has no measure marks on the side, and is only identified by the "Arcade Mfg. Co. Freeport Ill." that is embossed in the base of the cup. As is usual with glass of this age there are the normal swirls and straw marks, but there are no chips or cracks to report on this cup. This cup as well as all original Arcade cups measures approximately 3 3/4 inches tall. This is the later of the two Arcade "Generic" cups used on many grinders manufactured by Arcade. This later version of the cup has the writing on the base more towards the outer edge and the base itself is slightly less concave than the earlier "Generic" cup. In addition to the Arcade 25's this cup also came with the Golden Rule, Bell, and Monarch mills. This cup has no measure marks on the side, and is only identified by the "Arcade Mfg. Co. Freeport Ill." that is embossed in the base of the cup. As is usual with glass of this age there are the normal swirls and straw marks, and this cup also has some very minor chips near the base edge. This cup as well as all original Arcade cups measures approximately 3 3/4 inches tall. This is an Enterprise No. 100 which was manufactured by in Philadelphia, PA. starting in 1917. It retains it's original tin lid and about 90% of it's original rare white with gold trim finish. There is quite a bit of tan wall paint covering the mounting brackets that I didn't try to remove as the paint usually bonds together (grandpa couldn't be bothered to take it off the wall when he was painting). It has a horseshoe and star catch cup replacing the original cup. It has been completely disassembled, cleaned to like new condition and is ready to use. This is an Enterprise No. 100 with the more commonly seen original black with gold trim finish. The finish on the body is in fair condition but because the original gold highlights are still there it was oiled and brushed and left as is. The hopper is in good condition with the normal bubbles and straw-marks found in glass from this time period. The hoppers on these mills were made in a two piece mold and screw directly onto the grinder body rather than being clamped in place. It has a horseshoe tumbler that is very close in size and shape replacing the original catch cup. It has been completely disassembled, cleaned to like new condition and is ready to use. Original Catch Cup for the Enterprise No. 100 This is an original catch cup that was made for the Enterprise 100. It is in good condition with some minor chips around the top lip. There is one on the exterior lip, above the embossed "Enterprise" and a couple on the inner lip towards the back side of the cup which are all shown in the pictures. This is a very rare grinder that is a part of my personal collection. It is an earlier version of the 100 that is not shown in any of the Coffee Mill reference books and I have only seen one other complete example. It has a glass catch cup assembly that is similar to an Arcade No. 1 with the catch cup sliding between two rubber guides. The catch cup is embossed "Enterprise" on the front and has measure marks 1-5 and "Tablespoons" embossed on the back. This was manufactured in 1915 which is two years before the 1917 date given for the later Enterprise No. 100. This is a rare grinder manufactured by the Freidag Mfg. Co. that was located in Freeport Il. along with the Arcade Mfg. Co. This is their "Wardway" hopper mill that was sold by Montgomery Ward along with their other "Diamond Cut" mill. Both of the mills manufactured by Freidag used adjustment mechanisms that were unique. This mill used a knurled screw adjustment that moves the grinding cones closer together when moved toward the "F" or fine side or further apart when adjusted towards the "C" or coarse side. They appear to have sold both mills with either hopper attached. The hopper is embossed "Wardway" on the front and back and has a threaded base which screws into the body. There was NO finish on this mill when I got it except for a small patch on the back of the catch cup assembly. It was also missing the metal plate which covers the back side of the grinding mechanism so a copy was made using another identical grinder in my collection. The entire grinder was taken down to bare metal inside and out and refinished in a semi gloss black enamel. The only thing to report is that there is a small area with some bubbles in the glass below the "a" in Wardway but no chips or cracks. It has a horseshoe and star glass as a replacement catch cup. This mill has been thoroughly cleaned and is ready to be put to work again if you wish. This coffee grinder was manufactured By Landers Frary & Clark in New Britain CT. Called "one of the best wall mills ever made" by Joseph Edward MacMillan in his book The MacMillan Index of Antique Coffee Mills. This mill has a rare original glass hopper that is embossed with "Universal LF&C". I added a ball rubber gasket inside the body below the hopper to prevent any further chipping and so it stops when centered. The No. 24 is the only grinder that has a quick release mechanism where you loosen a bolt and remove the entire grinder from the wall for filling. It has a few minor scrapes and areas where the paint was chipped on the original black finish but is in very good condition overall. The hopper has one larger chip at the base and some chipping on threads but screws on and off easily and none of the chips are visible when the hopper is screwed in place. It has a Hazel Atlas Jelly jar replacing the original catch cup which I believe were unmarked. It has been completely disassembled, cleaned to like new condition and is ready to use. It measures right around 18" tall. The No. 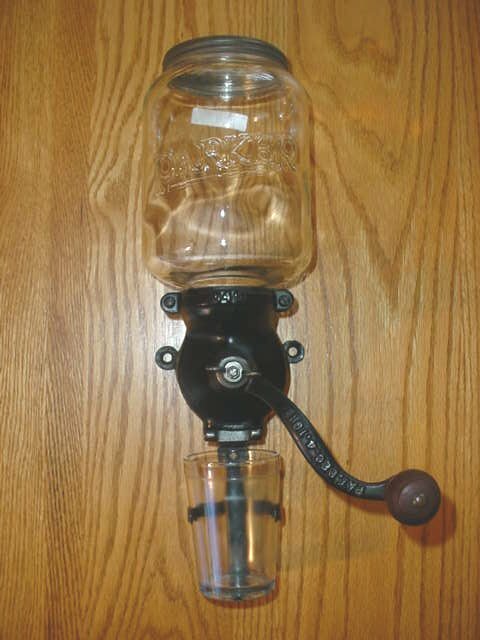 24 coffee grinder was manufactured By Landers Frary & Clark in New Britain CT. One of the great things about the No. 24's is that almost any threaded "Mason" style jar will work as a hopper. This mill has an old glass hopper that is open on both ends. It has a screw on porcelain lined canning jar lid that allows you to refill it from the top or you can unscrew the hopper from the base as it was originally designed. The body on this one was very rough with more rust than finish left. It was sandblasted to 100% bare metal and was then wire brushed to brighten the cast iron. It was finished with a clear enamel to keep the finish stable. It has a "Ball" rubber between the jar and body at the base to prevent any chipping and an old jelly jar used as a catch cup. The No. 24 is the only grinder that was designed with a quick release mechanism where you loosen a thumb screw and remove the entire grinder from the wall and unscrew the hopper for filling. It has been disassembled and all interior and exterior parts have been thoroughly cleaned to like new condition and is ready to use. It measures right around 18" tall. Manufactured by the Charles Parker Companies of Meriden CT. this mill features a hopper embossed with "Parker", the number "449" directly below the hopper, and "Pat. Dec. 4. 1917 on the handle. It has it's original tin lid and black Japanned finish. There is some scraping of the paint on the catch assembly but it is hidden by the catch cup. The interior has been cleaned so it's ready to be used again. It comes with an older replacement catch glass. This is an original catch cup used by Parker on their glass hopper coffee mills. This cup was definitely used on the No. 441, 446 and the Rev-O-Noc and I believe it was used on at least some of the other wall mount mills made by Parker. There are bubbles, small imperfections and waviness throughout the glass and a mold seam that runs up the sides but no chips or cracks. This one has raised lettering on the glass and I believe there was also a very similar version made with white acid etched lettering. Steinfeld Coffee Grinder or Mill This mill was manufactured starting in 1907 and is the earlier of two wall mount mills sold by the Steinfeld Brothers Company of New York, NY.. These mills were actually manufactured for them by T. Page and Son at 145 & 147 W. 18th St. in New York City. This mill was also sold under the name "ECLIPSE" removable glass canister coffee mill with the manufacturer being listed as the Challenge Mfg. Co. of New York. It has a unique assembly technique that uses only one wing nut on the upper and one screw on the lower section of the cast iron to hold it together. The hopper and handle are embossed "Steinfeld Trade Mark" and the back is embossed "Patent Applied For" I replaced the original gasket material between the hopper and the body as the original had dried out. This mill had at least three coats of paint that had been added by previous owners so it was sandblasted and refinished in a semi-gloss black enamel. The hopper has some chipping around the upper lip which is most likely from when it was ground down during manufacture. I have included an age appropriate catch cup that fits well and has a saw-tooth pattern around the base which appears to be a close match to the original. Steinfeld Coffee Grinder or Mill Sold by the Steinfeld Brothers Company of New York, NY, these mills were actually made for them by T. Page and Son around 1910 - 1920. This mill is the later of the two wall mount mills that they produced. The only markings on the mill are the words "Steinfeld Trade Mark" in script on the handle and also embossed on the hopper. It has very good original paint and the glass hopper is also in very good shape. The lid is a replacement, and it comes with an age appropriate catch cup. This is one of the earliest of the canister coffee mills and I assume this is a very early one as it doesn't even have it's patent date of 1891 embossed below the hopper as most do. It's hopper is now well worn, but some of the outlines of where it would have been originally painted with "Wilmot Castle", "Do not regrind with this mill" and usually the name of a hardware store who would have been the one to distributed the mill are still visible. Although I see no reason why this couldn't be used with a more through cleaning, I would consider this more of a display piece rather than a grinder for daily use so I have only cleaned and oiled the outside of this mill. This mill was made with two different catch assemblies and I believe this is the first variation with a screw off cup (the second variation had a sleeve around the cup with a twist and lock mechanism on the sleeve. This catch cup has a large chip out of the upper lip which is hidden when it is screwed in place but I believe it is original to the mill. Brighton Premier Coffee Grinder or Mill Manufactured by the Wrightsville Hardware Company in Wrightsville, PA this mill features a glass hopper that is embossed with the word "Premier" and it's rare original catch cup that is embossed "Wrightsville Hardware Company" around the perimeter of the base and "Premier" in the center. The catch cup does have a small stain on the bottom inside edge which does not want to wash off and some scratches from use but no chips or cracks. The body of the mill is embossed with "Brighton" on the front and on the back with "Pat Mar 28 1905". It retains approximately 75% of it's original black japanned finish. The handle has loosened slightly over the years but is still solidly attached and the top lip of the hopper has some chipping that most likely is from when it was originally ground at the factory. Questions? Comments? Click on the mailbox to send us an email.